What Happens When A Bicycle In Singapore Costs As Much As A House In The United States? Organizing your life so you don’t have to worry about the day-to-day ups and downs of the world’s currency markets, as we discussed on Monday, doesn’t mean you shouldn’t be watching to take advantage of currency fluctuations as they relate to your diversification plan. This week I wrote to my Marketwatch members to tell them about a current investment opportunity in the UK. The investment has merit of its own, but, with the British pound sitting as of this writing below its 11-year average and only 10% above its 11-year low against the U.S. dollar, moving some dollars into pounds right now seems like a good idea and adds potential upside to an already interesting investment. Cyclical dips in currencies can be a good time to rebalance your overall portfolio. If you’ve accumulated too much of one currency from a rental property, for example, then, barring an immediate need for cash in another currency, converting it on a dip makes sense. Not a dip looking at a period of a week or a month, but a dip over a long trend…like the 11 years I reference above for the pound. Taking a look at most major currencies compared against the dollar right now (the yen, Canadian dollar, euro, Swiss franc, and even the Australian dollar), they, unlike the pound, are all above their averages and some are close to their peaks for the same 11-year period. Many think the dollar will continue to fall against the major currencies of the world…that it’s ripe for a total collapse. As a friend told me once, back when thoughts of the dollar’s collapse began taking hold in the mainstream, a bicycle in Singapore can’t cost the same (in U.S. dollar terms) as a house in the United States. If that were to come to pass, the guy with Singapore dollars would go to the States and use his Singapore dollars to buy a house rather than a bicycle back home (barring any extra-governmental intervention that prevents a guy from Singapore buying property in the United States or moving his money around freely). If relative pricing were to become as out of whack as this example suggests, people holding another currency, whether it’s the guy in Singapore or an American who had the foresight to diversify out of the U.S. dollar, will exchange their euro, francs, pounds, and pesos into U.S. dollars to buy the relatively cheap U.S. assets. While the U.S. dollar may soon cease to be the main reserve currency of the world, which would have a negative impact on its value, a total collapse is unlikely. But a permanent repositioning of the dollar’s long-term trading range could occur over a period of time. The British pound was the reserve currency from the 1800s until World War II. 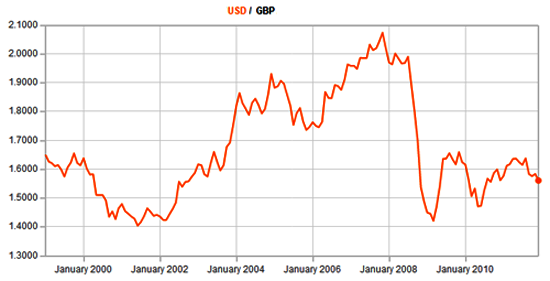 During its days as the reserve currency, the pound traded in a range of US$4 to US$5 to 1 pound sterling. After the pound lost its status as the world’s reserve currency, that range moved to US$3 to US$4 to 1 pound and eventually to where it stands today (and where it has stood over the past decade), at US$1.5 to US$2. If the dollar’s demise plays out similarly to the pound’s decline, you have some time to diversify yourself out of the U.S. dollar, but you want to start planning now so you can take advantage of cyclical dips when they come.